Men paddle their boat through the lawns of a partially submerged church at Kuttanad in Alleppey district in the southern state of Kerala, India, Aug. 24, 2018. 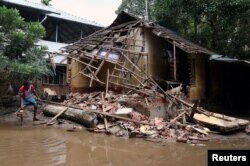 A man removes debris from a collapsed house after floods in Paravur, in the southern state of Kerala, India, Aug. 23, 2018. Volunteers collect household items in the lawns of a residential house before cleaning the house following floods in Kuttanad in Alappuzha district in the southern state of Kerala, India, Aug. 28, 2018.